Perth has a large range of accommodation including hotels, suites, motor inns, serviced apartments and backpacker accommodations. All the international hotel and apartments chains are represented, including Sheraton, Hilton, Hyatt, Novotel, Ibis and Holiday Inn. Local chains Rydges, Metro Hospitality Group and All Seasons have a presence. 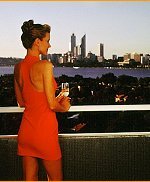 Perth, in fact, has the highest number of first class hotel rooms, on a pro-rata basis, of any city in Australia.